I want to share with you a type design project that I've been working on for about an eternity. Mell Sans is a sans-serif typeface which is based on some well-known classics, like DIN, Futura, Gill Sans etc. but also has some unique characteristics of its own. My aim with it has always been to reach the elusive balance between being generic enough to be useful for longer texts but at the same time, as original as possible. Also, I am inclined to play with the thickness of some stems (but without really creating a reverse-contrast typeface). What you are seeing now is the semibold weight, but I also plan to make a whole family, with cursive and (possibly) monospaced versions. My primary target is screen usage, more specifically web. Mell Sans is my first serious font design project (though I made a couple of display faces a couple of years ago). I began developing it in 2015 but I made a couple of huge pauses, as I was out of ideas. It started out as a geometric and "technical" typeface. Then after a few years it started shifting away towards more humanistic forms. I think incorporating different influences makes the typeface more interesting, and my current design is, I think, close to this equilibrium. But then I thought the same way a few years ago. I am attaching two pdf files - mellsans.pdf is generated from a web page and mell_sans_preview.pdf from a traditional document. The reversed diagonal contrast on the A is just weird and out of place, unless you follow it through in major other ways. But I suspect it will never look playful, just odd. - the bottom seems heavier than the right side, making it seem like it has reversed contrast... only the top doesn't follow suit. - the bowl’s outer top contour, the on-curve point is just a little too far left, contributing to the squished corner. The diagonal contrast is something I am experimenting with, and it is present in other letters also (did you took a look at the pdf-s?). I will take your opinion into account when I am deciding whether to keep it. I do think you are correct about the "b", although I am having trouble following you on some of your thoughts (what is "squished"?). I will work on it more. Maybe it is starting to look a bit sloppy because recently my focus was getting the font to work on smaller texts. I’m not much of a font expert when designing type. Suggest exploring building modular font as it will teach you a lot to look at letters in more detail. It’s a brave start, as simple as it looks to draw out letters of this nature, jumping into Cyrillic letters creates a lot of work especially revisiting to make changes — it takes a lot of practise to get it perfect optically to the trained eye. Made some basic notes even that alone you’ve given yourself big task to go back and forth making changes as you’ve gone to far. 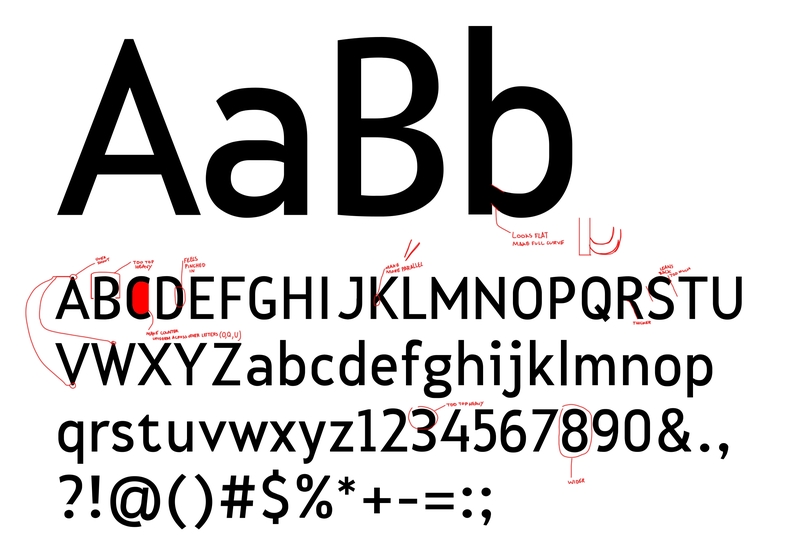 Even Futura never actually looked the way it is now, it had an essence of modular construction. Advice start off with H, O, P, h, o, p, as the shapes in those letters will carry similarity among other letters which you can borrow to construct other letters. Really look at your counters in relation to the shape of the letter see where your eye stops. Thanks for taking the time to go through each letter. I will take all your notes into consideration. Not sure what you mean by "modular construction"? Is it to reuse some basic shapes in all letters? If so than I am using this technique very heavily in Mell Sans. Here are some of my shapes below. 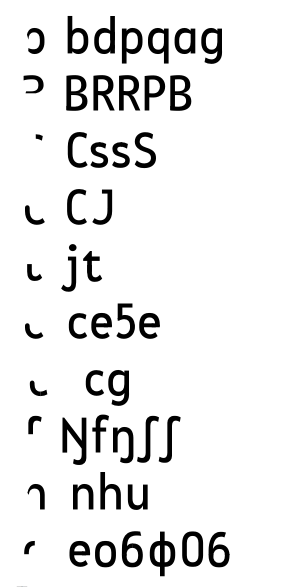 These are just the most used ones and in fact, lately Mell Sans is becoming less modular than it was at the beginning simply because I am making optical adjustments to some glyphs. For example, the difference between the top curve of "h" and "b" is minuscule and it exists there only lately - they were one shape originally. So again, not sure what do you mean. The top counter of the B should be noticeably smaller than the bottom one.